Mundulla is a town in south eastern South Australia. 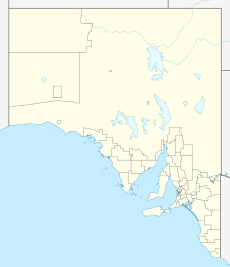 The town is located in the local government area of Tatiara District Council about 278 kilometres (173 mi) south east of the state capital of Adelaide. The name of the town is derived from the Aboriginal word mantala meaning "place of thunder", referring to a rumbling sound made when trampling on the earth as a result of the many caves in the area. The Council enquired about the spelling in 1965 and the Postmaster General proposed to change it to Mundalla in 1972, but this was not approved by the Geographical Names Board. At the 2011 census, Mundulla and the localities of Bordertown South and Pooginagoric shared a population of 675. The Mundulla school opened in 1878. An Australian rules football club, Mundulla Football Club, compete in the Kowree Naracoorte Tatiara Football League. In 2016 Mundulla was the subject of an episode of Back Roads. Mundulla Yellows is a disease fatal to (especially) eucalypts, characterised by all leaves on a limb turning yellow then dying. It was first observed in this area in the 1970s, and has since been observed in every other State including Tasmania. Of unknown cause/s, it has several peculiar attributes: slow irreversible progression towards death and presence of unaffected trees among the dead and dying. ^ For the 2011 census, the ‘State Suburb of Mundulla’ consisted of the localities of Bordertown South, Mundulla and Pooginagoric. ^ a b Australian Bureau of Statistics (25 October 2007). "Mundulla (State Suburb)". 2006 Census QuickStats. Retrieved 15 June 2017. ^ a b c d "Placename Details: Mundulla (LOCB) with the following layers selected - "Suburbs and Localities", "Counties", "Hundreds", "Place names (gazetteer)" and " Development Plan Layers"". Property Location Browser. Government of South Australia. 4 March 2010. SA0047722. Retrieved 11 February 2016. Town surveyed in May 1872. An enquiry from Council regards the spelling-vide DL.1130/1965. A proposal to alter the spelling to Mundalla by Postmaster General was not approved by Geographical Names Board on 27/10/1972. Boundaries created in March 2000 for the long established name. Mundulla is derived from "mantala" an Aboriginal word meaning "place of thunder". It was spoken of where the ground is undermined with caves, which rumbled when trampled upon. Evil spirits are believed to frequent such places. Incorporates the Government Town of Mundulla. ^ "Limestone Coast SA Government region" (PDF). The Government of South Australia. Retrieved 10 October 2014. ^ "District of MacKillop Background Profile". Electoral Commission SA. Retrieved 29 March 2016. ^ "Federal electoral division of Barker" (PDF). Australian Electoral Commission. Retrieved 28 March 2016. ^ a b c "Padthaway South". Climate statistics for Australian locations. Bureau of Meteorology. Retrieved 15 June 2017. ^ a b "Morphettville - Munno Para". Place names of South Australia. State Library of South Australia. Retrieved 7 November 2010. ^ Gerritson, Tim (29 June 2009). "Football upset: Pumped up Mundulla downs leader Keith". Australian Broadcasting Corporation. Retrieved 7 November 2010. ^ "Back Roads Series 2 Ep 1 Mundulla". iview.abc.net.au. Australian Broadcasting Corporation. Retrieved 4 December 2016. ^ "Old Wirrega Council Chambers". South Australian Heritage Register. Department of Environment, Water and Natural Resources. Archived from the original on 15 February 2016. Retrieved 11 February 2016. ^ "Restaurant, previously National Trust Museum (former Mundulla General Store, Post Office and Hotel)". South Australian Heritage Register. Department of Environment, Water and Natural Resources. Retrieved 11 February 2016. ^ "Mundulla Yellows (MY)". Australian Government. Retrieved 8 June 2018. This page was last edited on 17 December 2018, at 01:09 (UTC).